It doesn't take turn-by-turn directions to figure out that Google Maps is one of the biggest advantages that Androids now have over the iPhone 5 and Apple devices upgraded to iOS 6. Former Google CEO and current chairman Eric Schmidt clearly agreed in an on-stage interview with AllThingsD. "Apple should have kept with our maps," Schmidt said bluntly to some crowd laughter. When asked if Apple's decision stemmed from Google not maintaining feature parity - specifically not allowing iOS to use and turn-by-turn directions and voice prompts with Google Maps - Schmidt deflected the question. "We negotiated all of these details with Apple, and the fact of the matter is they had decided a long time ago to do their own maps," said Schmidt, neither confirming or denying turn-by-turn directions were on the table. "What Apple has learned is that maps are really hard," said Schmidt. "We invested hundreds of millions of dollars in satellite work, airplane work, drive-by work to get the maps accurate. And we think we have the best product in the industry." "Apple has done extremely well during the last five years," said Schmidt, before amending his statement to say Google played some part in that. "Actually, Apple has done very well using our maps." Schmidt has previously admitted that Google hasn't done anything about maps on iOS 6 yet. But what does the future hold for a Google Maps app on the platform? "I don't want to pre-announce products," Schmidt cautioned, "But I can tell you that were we to do that, they would also have to approve it." The future of the native maps app on iPhone is certain in Schmidt's mind. 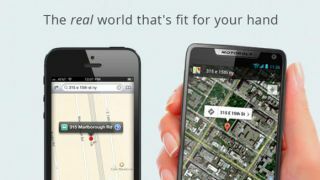 "Apple has clearly made the decision to do their own maps," said Schmidt. "They made that decision a long time ago." "I think we should assume that they will continue to make their maps better and address the criticisms that exist." Indeed, Apple has already made improvements, like returning the Statue of Liberty back to its rightful location in New York Harbor. It's also fielding complaints from Taiwan's government and other countries for not blurring high-security spots. Considering Google Maps' newest comprehensive update, there are still a lot of known issues with Apple Maps before the company can catch up to Google and make iOS users less directionally challenged again.